My first 2 days in Ubud, Bali were at an Airbnb, an odd experience as a solo traveller to be honest cause unlike all my previous Airbnb stays, this was a hotel. Nice but unexpected I guess. 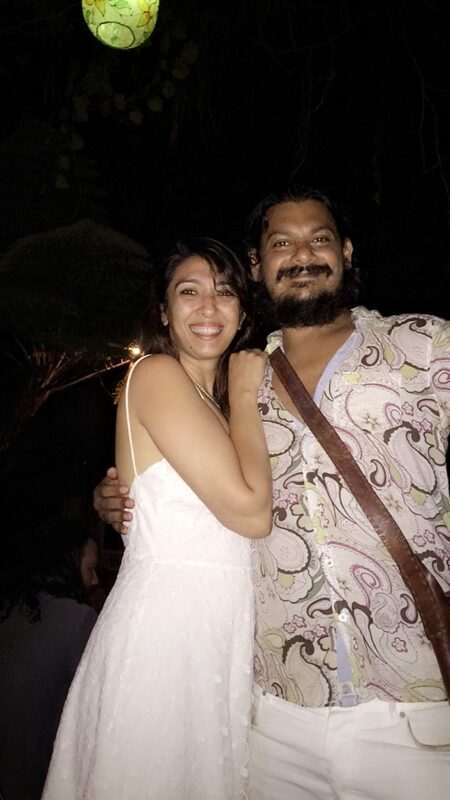 I connected with my friend there Tridip; one of the happiest souls I know and the world seems to love him back as much. He took me around and guided me on what to do in Ubud and then showed me one of the most amazing.. almost out of body experience. Get it? No right? Exactly how I felt.. I mean the music was ammmmazing but I just couldn’t get myself in a mood to dance. 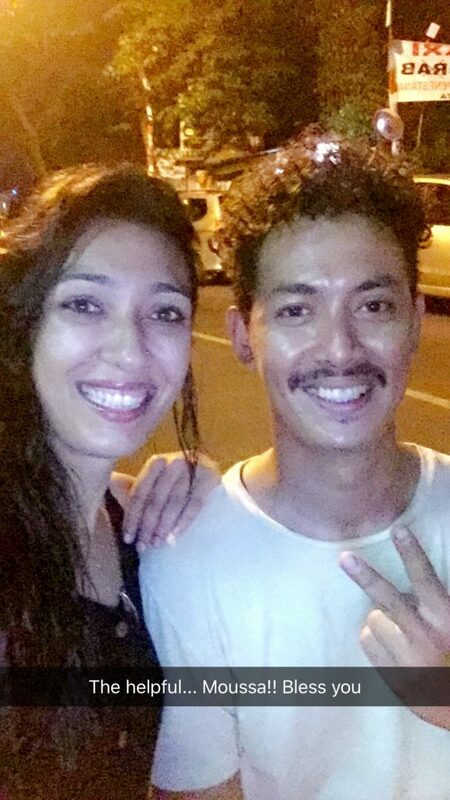 And oh wait.. the weirdest part… everyone was dancing… like proper dancing in their own sweat.. and not the cool moves but almost yoga like posturing and work out.. and that too on their own. No one was dancing with anyone, no one was looking at anyone. Just lotsa bodies dancing on their own like … like it looked pure amusing to me! My friend soon joined them and was lost in the crowd. I did try.. awkwardly but just couldn’t get myself to dancing. So I went outside by the pool and sat. I sat and I watched. First amused and shaking my head in amazement and soon… thinking about what I was witnessing. I was witnessing Magic! I was seeing Music! I was seeing people, not high on anything, losing themselves to sounds and moving their bodies to it. They were in a state of trans. Transcended to a state where the world and its eyes didn’t matter, they had let go of all their inhibitions and looked like they were having a cosmic dialogue with someone only they could see and express to. And from thinking that they were uncool.. I suddenly realized how uncool I was feeling. That no matter how hard I was trying to let go, my brain had programmed my body on how to be cool in such a limiting fashion that now I couldn’t let go. This was the point I saw me change. In hours. I strongly urge you to do this if you ever visit Bali. It’s almost life-changing and prejudice breaking. Tridip had asked me to stay at a friend’s hotel for the next few days, but when I got there, they had cancelled my booking without any information. Yes, and so I was stranded.. in the rice paddy, far from the city with a mean staff, a big suitcase and a taxi guy who was wonderfully patient. I called Tridip of course, and he being the king of ‘Chill’, said, “Calm down I got friends here”. He was going to some friend’s place for music practice and asked me to join him. So totally frustrated, angry, grumpy and confused I got there, and as I was unloading outside this typical Balinese house, I could hear a very soothing and very familiar music. It was an instrument I hadn’t heard in the longest time and I thought I heard someone sing in Hindi perhaps. As I approached the old door, I was certain, I was listening to Harmonium, tabla and Shabad (Sikh religious Hymns). Lemme paint a picture.. 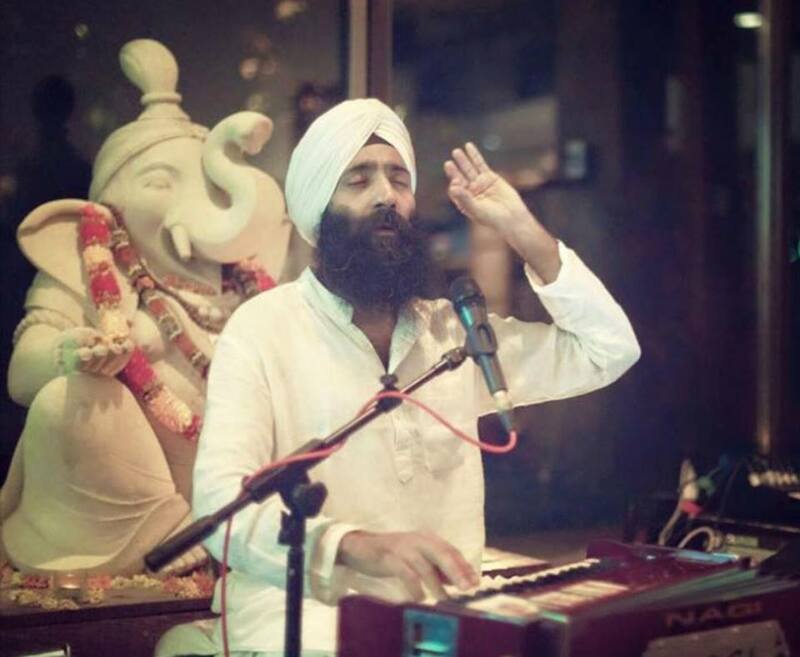 I was in Ubud, Bali, in a traditional Balinese house, face to face with the most gentle faced Sardarji on a harmonium singing Shabad with people from Bali around him on Tabla and a guitar. And what a voice he had… I was lost in his voice. 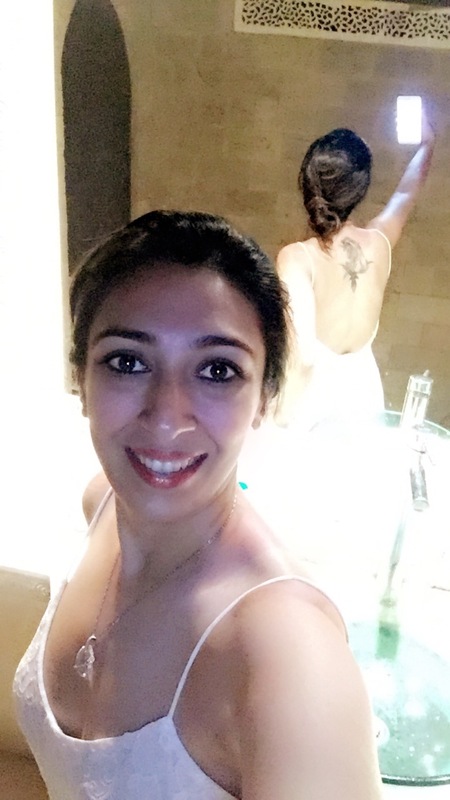 Punnu Jee! Punnu Jee had come to perform Kirtan to Ubud long ago and never left. He now was a yoga instructor at the Yoga Barn and ran a music group called Bali Kirtan and was blessed by the gods. A humble man with the largest heart. It only took moments of talking to him after being introduced that he so easily opened his house to me to stay for as long as I wanted. Can you imagine? It was like I was in Pink’s song again (Glitter in the air- Have you ever invited a stranger to come inside) Through all the stories of people being skeptical, I felt like the luckiest girl to meet the second person in my journies and be hosted in their homes, even when they didn’t know a thing about me. They trusted me and I was able to trust them back so easily. I knew for sure that what seemed so natural right now was the rarest thing in the real world and yet I was in the real world. But I was speechless. All he wanted in return was a kadak desi chai; and I was the happiest to get in his kitchen and find my way around his spices. Later I met his beautiful wife and I think I was expecting to read some discomfort in her body language and there was NONE… she was as loving and made sure I ate well all the time too. Punnu Jee gave me a set of his house keys and said I could come and go as I pleased and showed me to my bedroom. I think I had the calmest sleep at his home. I felt I was home. 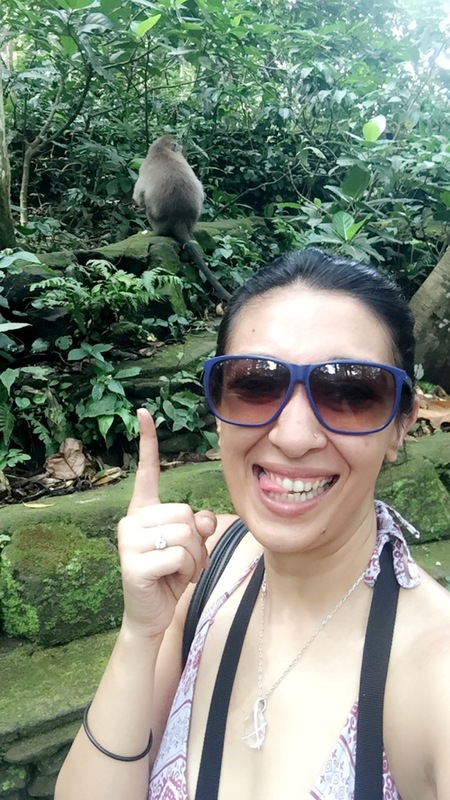 Next day I went to the Monkey Forest. A hot hot hot humid day. Here is another reason why I love Ubud so much; it is natural. Allow me to explain; people are kind, sensible and logical. Don’t get it? Lemme give you an example.. this place was hot and humid, they don’t use Air conditioners everywhere and realize that some of us don’t have the money for taxis all the time. Infact, most restaurants also don’t have ACs. So what should the people wear to feel comfortable? Comfortable clothes right? Yes! Comfortable, Cotton, Breathable clothes and Bras are not any of the above. And so they are not a compulsory clothing there. And women; its great trust me! 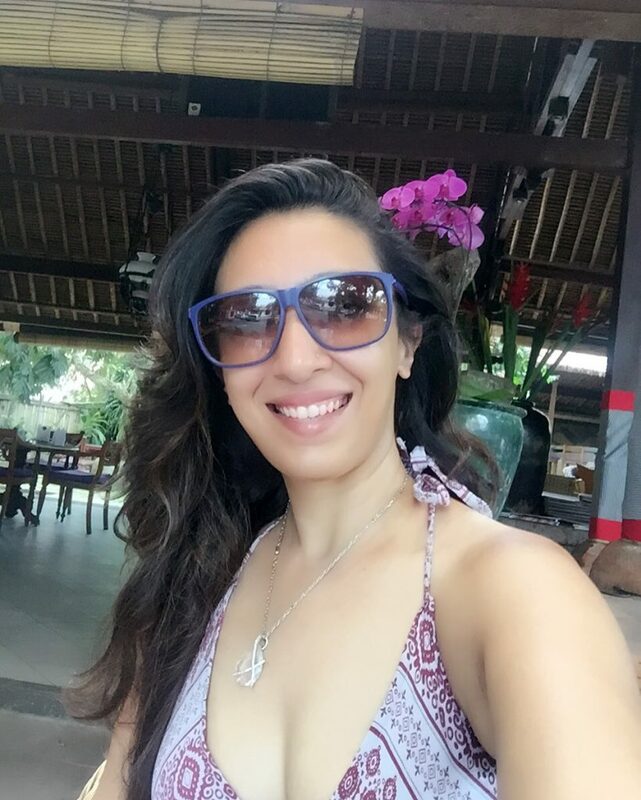 No one cares about how you look, comfort and natural is the most important thing in Ubud. 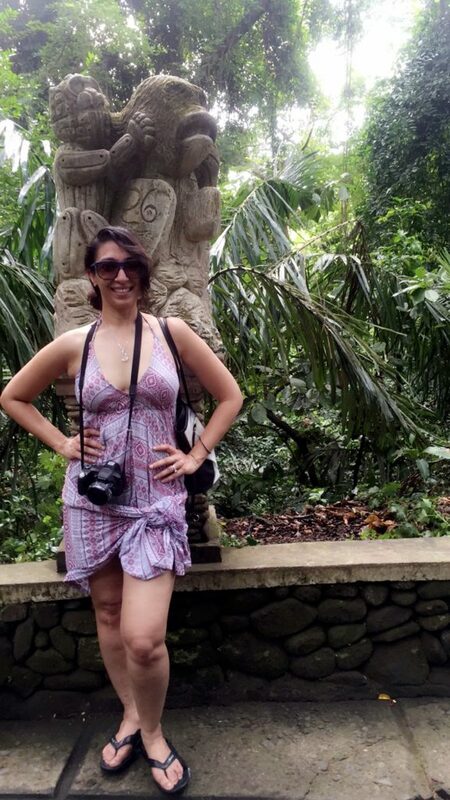 So I wore my comfy cotton dress that I picked from a road side shop and entered the forest. The forest was grand.. with the 14th century temples and bridges. The highlight were obviously the Monkeys. As I struggled with the sweat and sun, someone passing me said, keep your sunglasses inside your bag, they will nick them. I did. When I’m travelling I listen to advice very easily. I have to know that I’m the alien in their land and they know it better and so if they say Don’t… I just don’t! I put my sun glasses away and kept walking until suddenly just as I was lost taking a great shot of this view of the forest, I felt soft paws land on the back of my shoulders, only for a fraction of a second and were gone. I screeeeamed ofcourse, only to be calmed by a peaceful and smiling man with gestures pointing at the monkey who had just used me as his jumping board to climb the high branch behind me. He looked amused, but not at the monkey, at me. I was in their home. And they made it clear repetitively. As I was crossing one of the main bridges.. the funniest thing happened, one guy lost his sunglasses to 2 monkeys and hhahhhahahh they were adorable with it. The guys reactions were.. ummm.. epic ofcourse as well. Thank God I had put my glasses in my bag! Ok! Heads up! 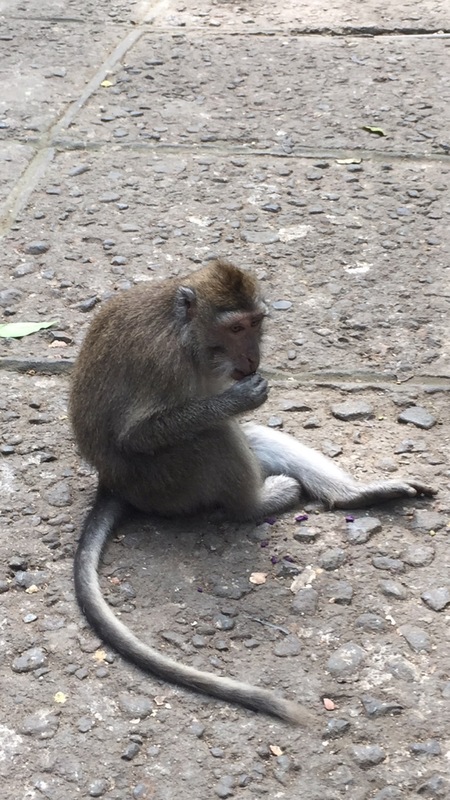 The macaques (monkeys) can be notorious so it’s best to walk the line and not carry any food. Rabies is a known devil here. Make sure you are camera ready for the absolutely amazing relics and moss laden stone steps and the picturesque bridge near the ancient bathing temple. It’s a walk but absolutely worth it! 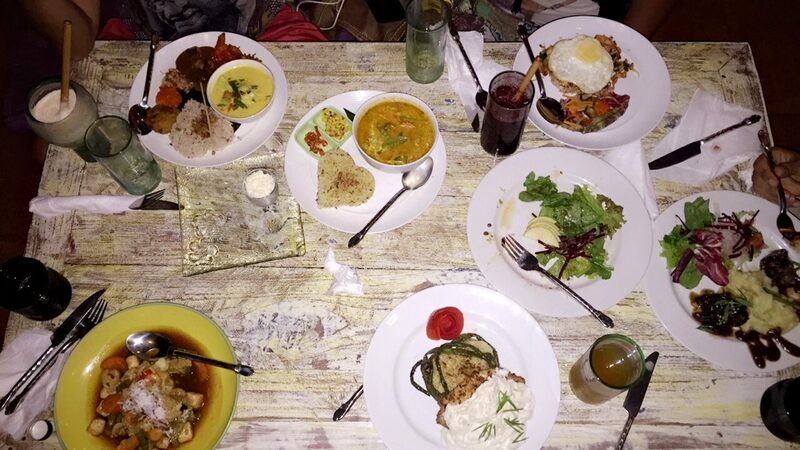 On my last night in Ubud, I decided to treat Punnu Jee and his wife to dinner and they recommended the Clear Café. 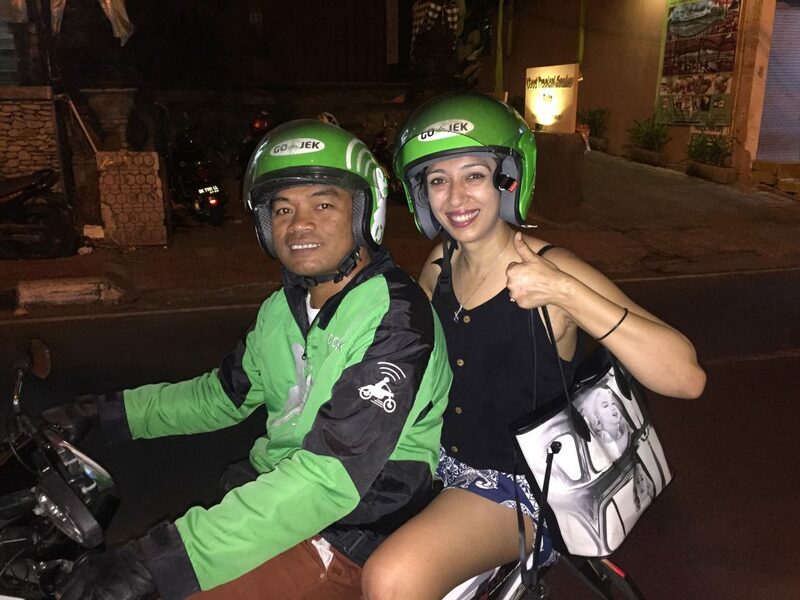 I also took my first Go Jek ride. It’s a must have app for Ubud. You can call for scooty taxis and they come with a helmet and are absolutely reliable. It was only when I got there that I realised I didnt have enough cash and had to withdraw from an ATM. Not all places are card friendly in Ubud, cash is just better. The closest ATM was close by! NOT! It was probably only 500 mts but twas all up a steep uphill walk. And I was dying and panting in about 200 mts. Breathless, sweaty I stopped at a shop and begged for a glass of water from the kind faced owners. They gave me a whole bottle and then also offered to take me to the ATM. Isn’t it sad that we are not used to such kindness? But I like trusting people and following my gut. He took me there, patiently waited for me to withdraw money and buy my top up for my mobile and then dropped me back to the Clear Cafe Too! God Bless him! Endless conversations flowed and recommendations for my next stop started pouring in. We ran into some friends of Punnu Jee there from Philippines and it was just incredible how travel stories just never stopped and I became connected with these two wonderful men Alden and Aldrin from my heart. I asked Punnu Jee where he would love to visit next in Bali. He just had to say “absolutely obscure place with lotsa waterfalls” and I was already planning my cab fares and looking for Airbnb in that location (Blog on that coming soon). Thank you Ubud for showing me your beauty in people, food, places, music, air, water and we shall now share this Cosmic Connection forever!